Giving you the confidence to express your individuality, Pacinoble takes major trends, adding the freshest Pacinoble spin. All the gear you need - including in our fit ranges Plus and Tall and our Pacinoble Makeup collection - to create your coolest look, then switch it up again tomorrow. Make every day, night and everything in-between as extraordinary as you are. With lightweight bright fabric,shiny under light,cool looking all the time. 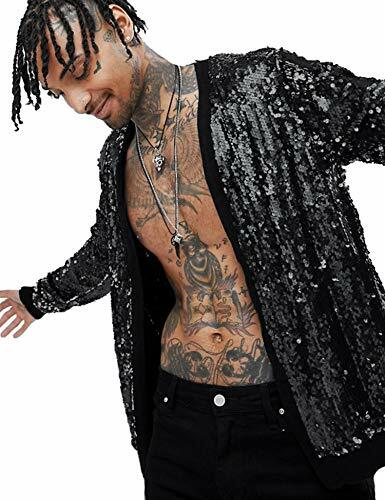 Classic Sequins jacket which shows the most fashionable style lets you be always eye-catching. Size Suggestion:Our Size is Standard US Size. Also, If you are not sure of your size, Please read the Size Information of Product description in order to choose your own size! If you have any questions about this product by Pacinoble, contact us by completing and submitting the form below. If you are looking for a specif part number, please include it with your message.